Timor Leste's Prime Minister, Mari Alkatiri is the Marxist leader of a socialist government. While he is happy to take Western and UN handouts and military assistance, his heart lies with the revolutionaries. Are our troops going into Timor Leste to save a Marxist regime? 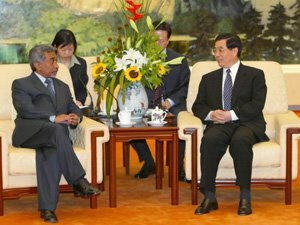 BEIJING, Sept. 18 Chinese President Hu Jintao met here Thursday with Mari Alkatiri, prime minister of East Timor. Hu said that China and East Timor have enjoyed long-term friendship, and the two countries forged diplomatic ties soon after East Timor became independent one year ago. Based on mutual respect and equality, the cooperation between the two countries has expanded and the trust has furthered over the past year, he said. Hu expressed appreciation for the support of East Timor to China on the Taiwan and other issues, and said that China will, as always, support the efforts made by East Timor and the international community to stabilize and develop this new country. Alkatiri said that he is here to improve the cooperation between East Timor and China in all fields. He also expressed gratitude for China's economic aid towards East Timor, and said that the East Timor government will continue to adhere to the One-China policy, and support China's stance on the Taiwan issue. He hoped that China would play a bigger role in the international and regional affairs. I have already covered Alkatiri's December 2005 trip to Cuba. Towards the end of last year East Timor's Prime Minister Mari Alkatiri paid a visit to Cuba and held talks with Fidel Castro and other Ministers in the Cuban Government. Cuba is to receive another 400 young people from East Timor to be trained as doctors and teachers. Castro also announced that a group of 300 Cuban doctors are to travel to East Timor. They will help train health professionals in Timor and work at the Faculty of Medicine recently opened in Dili. Fidel also announced that two technical experts have gone to Dili to establish the use of the new literacy method that will allow the rapid teaching of reading and writing in Portuguese in a country where 50 percent of the population is illiterate. 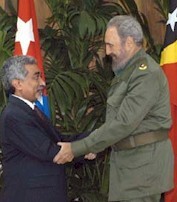 In discussing the struggle of the Timorese people for independence with Prime Minister Alkatiri, Fidel Castro recalled the similar struggles of the people on the African continent and informed Mari Alkatiri of the considerable medical assistance being given by Cuba to many countries of Africa, South America and the Caribbean. The Democratic Republic of East Timor has a population of 770,000. Most of its people remain poor even though it has oil and gas resources. Prime Minister Alkatiri remarked that Cuba showed what could be done despite having few natural resources. New Zeal I will post soon on the real purpose of Cuban "literacy" programmes.